I’ve pulled out my ‘Becoming Raw’ book and flicked right through to the back to the menu planning section. Becoming Raw is a book which goes into all the details about nutritional aspects of raw food. It discusses Recommended Dietary Intakes, Enzymes, the effects of cooking and it is all based on scientific research. The reference section at the back of the book is huge! An excellent book for anyone who wants to learn more about the nutritional aspects of raw. Anyway – let’s see how this goes… I am working up to it – trying out a few recipes first. My first is supposed to be Blueberry Kale Smoothie but I only had spinach in the fridge. Kale is packed with higher nutrient content than spinach so when I actually ‘do’ my days 100% raw at the RDI I will use Kale in this recipe instead. 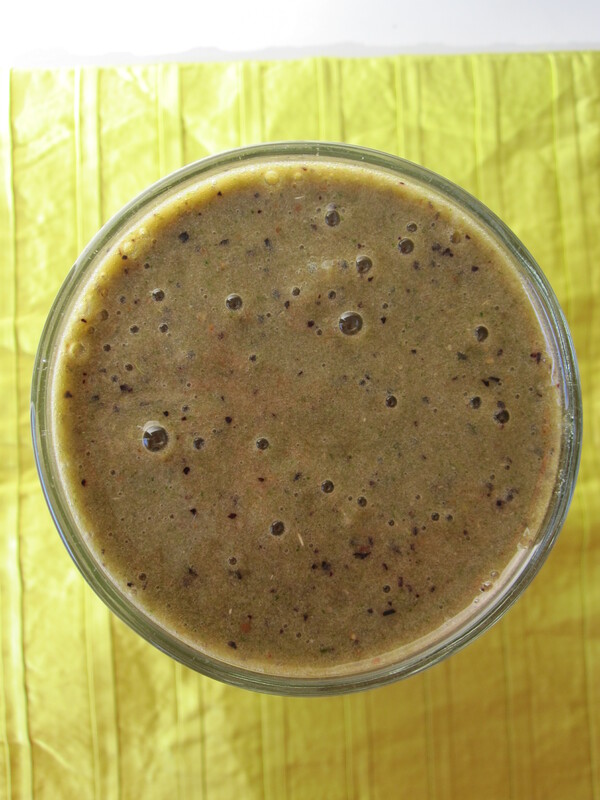 Blend together 2 cups kale or spinach, 1 1/4 cups blueberries, 1 frozen banana, 1 peeled orange, 3/4 cup filtered water and 1 Tbsp. ground flaxseed. This is 1 serving and will make about 2 1/2 cups.